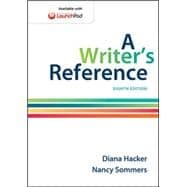 To package LaunchPad free with A Writer's Reference, Eighth Edition, use ISBN 978-1-319-00920-5. Have had this book since my freshman year in college and it has helped me through countless papers and articles that had to be written. It's definitely worth the extra money to just buy a copy of this one since you will use it so much! A Writer's Reference: 5 out of 5 stars based on 1 user reviews.